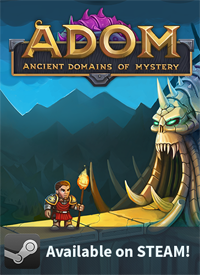 The Official Blog for ADOM (Ancient Domains Of Mystery): The ADOM crowd funding campaign is over! 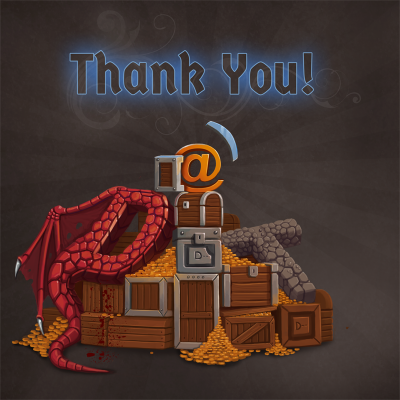 The ADOM crowd funding campaign is over! And it was a totally amazing, absolutely awesome resounding success. Much more than I ever dared to expect, much more than any troll ever believed possible and much more than one game designer can hope for. But we did it... and broke record after record. Thank you so much for everyone who donated... and there were lots of people that donated so much that I can't express how awed, humbled, amazed and impressed I am. You are truly the greatest community a game designer ever could wish for!!! And what a heart beat match it has been... we unlocked the $90,000 level literally in the last second of the campaign!!! Over the months to come we'll see a ton of new stuff appear (I'll need to write down all the extras that added up in the past 24 hours) but besides tons of new quests (literally) tile support, audio integration, Steam support, new races, new classes, volcano quest, Rolf quest, achievements, ADOM RPG and what not ADOM now truly has the chance to become a true 21st century roguelike game. Thank you so much for all the love - I'm beyond words!!! We'll now happily take the huge responsibility this puts on our shoulders to give our blood, heart and soul to produce the best ADOM ever... and the best ADOM Deluxe ever. Due to the totally unexpected amount of extras we managed to unlock it will take months to create the finished version (quite a few months). We'll try to be as transparent as possible about the whole process and keep you updated constantly. Getting to work (long day ahead). Getting all the submissions and manual upgrades sorted out (that alone probably will take a full day or two). Get the open taxation question sorted out (Germany is a third world country in regard to crowd funding and taxation issues, hints from others are very welcome). Get contracts set up with the team. Sort out all the extras and completely rewrite our project plan. Get the infrastructure finished to be able to do quick automated early access releases (Jochen is 90% done). Then we'll start implementing and releasing. As I said: Thank you once more!!! Congratulations Thomas. If you ever needed validation of your hardwork, I believe this qualifies. I know you have a few long days ahead of you so I hope you can get some sleep. Congratulations. After so many years of Adom development, it was nice to be able to support you somehow. I'd suggest you deliver what is promised, and then run second campaign to get funds for the goals which were missed today (iPad, full color RPG, etc.). When you deliver, you'll get more traction, so getting the remaining $40k+ should be easier than this time. Second campaigns are generally seen as being cheap and exploitative of community goodwill. I'm sure Thomas is more than happy with the overwhelmingly positive results of this campaign. And he's said iPad support may come in the future anyway. 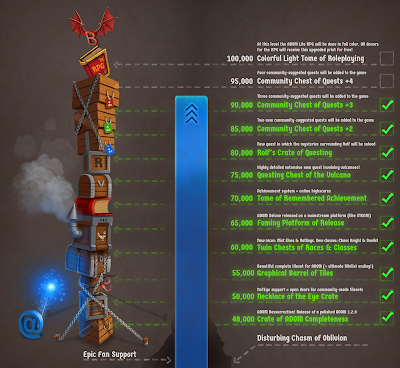 Fortunately we reached the Steam goal, and I hope ADOM Deluxe on Steam should generate enough money that the missed stretch goals can be realized without the need for more campaigns. This is day to remember... 31.8.2012... Would that be 30th of falcon or darknight (1st) of cup? I think it should be memorialised as a special day for starting the game. Just as TB's birthday is "Creator's Day", this could be "Day of Resurrection". Not sure what an appropriate effect would be, but perhaps all PCs start with companions and some multiple of their normal starting gold, or something? As Jeff says, complete validation of your success with ADOM. You've truly made something that can inspire mankind. Thank you Thomas, and a big thank you to all the other ADOM fans that donated or promoted the campaign. We have such a fantastic community here that everyone should be proud to belong to. I said it could be done. I even predicted that an amazing amount of support was out there, and that over $60,000 was easily possible. But standing here, looking at the final numbers, even I, ever the optimist, am amazed. In disbelief, even... A huge and hearty congratulations, Thomas, from here in the states! The stretch goals I was hoping for got funded, too. Yay, Ratlings and the Volcano Quest! I raise a glass in honor of your awesome achievement. Congratulations again. Hope to see first version of new adom in a few months. Holy crap man! I've never played ADOM, but I gave 10 bucks right near the end there just to be part of something so epic. As I've said before in other posts...Sometimes the world makes me smile. PS: Man if you were in the US I could easily slide you past all taxes. Investment and business expenses are the sacred cows of our tax code. Congratulations! I don't think I'm the only one surprised that the campaign raised even 48k, but this is amazing. Enjoy your pile of gold and I'm looking forward to these exciting times ahead. Man. Get this one Steam. Sell a bajillion copies at 5 bucks a whack. Live the dream. Congratulations are indeed in order, what a great success this was. And I can't think of a dev nor game that deserves it more than you/ADOM. Thomas, thank you for all your time and effort all these years. 1000x the game of any AAA title! Looks like adom guidebook will need a massive rewrite now! This was amazing. So great to be a part of it. What I'm really looking forward to is seeing a big, big list of what we actually got put into the game. Including quests, bug fixes, new monsters, how many new items, how many statues with inscriptions, etc. Yeah, we've started sorting out all the new stuff and I probably will post a chart or image of some kind showing all the things (and having you out there if I forgot about anything - the last couple of days have been a bit of a daze ;-) ) that will get added, meta tasks (to teach trolls about the complexity of such projects) and illustrate the dependencies. This might ruin my real life... I`d better do as more as possible before the release. My dad introduced me to ADoM in 1993/1994 (I think! It was definitely pre-Minotaur Labyrinth and pre-Claw Bug Temple). I played it on the Amiga for years and years, played it on the PC too. I have an i5 2500k, 8Gb DDR3 and 2x 1Gb HD6870's in CrossfireX and I still find myself going back to ADoM for a bit each year. Donated $40, being a balance between what I could afford and many goodies. I love how you got introduced to ADoM by your dad. Does he by any chance still play? Congrats on a tremendous success! Since you are likely to be duly occupied as noted above for the next few days: How about shooting for participation in ARRP 2012 in the form of the long awaited and nearly wrought ADOM II 0.3.0 release? I should think it the best venue for it to not get lost in the shuffle as well as garner some review coverage from those that make a habit of testdriving and reviewing all the entrants each year----the timing seems quite ideal. 90,000 dollars? Awesome! Races, classes, tiles, quests...everything I wanted with ADOM! And Thomas, unless you work sixteen hours a day on this, I'm positive this will take more than a few months to finish. Still, I look forward to it and can't wait to play the new ADOM! You know, if you don't count Dwarf Fortress. Actually I never counted Dwarf Fortress as a roguelike. Is it? Eh. The adventure mode is. You're a single character in a procedurally generated world represented by ASCII, and you take quests, explore dungeons, and kill monsters. The city-building mode isn't really roguelikeish, though, and that's where the majority of the focus (both in development and playing) tends to be, so the omission is understandable. Ah, ok, I'll be more careful about my statements. DF always was registered in my mind as being focussed on the building part and thus I failed to recognize it as a roguelike. No slender intended. DF has Adventure mode from beginning of the development, so yes, beside strategy it's also a roguelike. And they're making it more complex now. Yay! This is an exciting time to be a backer of such a cool project! I'm 26, and I started playing ADOM when I was around 13. I think the amount of funds raised, represents the way (i.e. how much they care about) people view the whole history of ADOM and how much T. Biskup did for no money (postcard-ware), for years. I remember when steel golems were a big gray "S", and thinking 'wow, my low level character sure met a hard monster in an early level dungeon'. We remember when the assassin guild was a brand new destination, we remember the addition of the mana temple. Reading each new release notes for what changes have been made. I think that's why people were so willing to give! Congratulations on this! The last time I looked at this page was yesterday, and it was sitting at just over $75,000. I know there were 2 people who donated $2,500 to meet the $70,000 and $75,000 stretch goals, but what the hell happened after that? Did somebody give $10,000 or some crazy amount? ADoM was the first roguelike I ever played, and it was the game that solidified my desire to become a game developer. 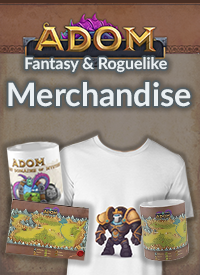 I haven't released anything yet at this point, but I just wanted you to know what ADoM has meant to me. And seriously, congratulations, this was a bigger success than I thought you could ever get out of this! Also, not to rain on your parade, but is ADoM 2 going to be pushed aside until this is done? Congratulations Thomas Biskup. After all these years ADOM is going to be resurrected and my wait will be over. After the resurrection and hours of frustration and happiness. I'll be waiting for the "Full release" of ADOM II. I think you will be busy for quite a while. I'm happy I could be part of this great campaign. Looking forward to discovering all the new things added into the game. Please, include in game possibility of translating text to other languages ​​(including Cyrillic). That will be very happy. Perhaps something could be done in an overlay sort via NotEye itself rather than the ADOM core or some such? It has all sorts of features beyond just helping to slip tiles in and all. 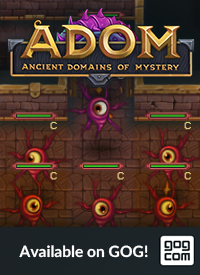 Where do ADOM fans lurk? ADOM: Now let's build the future! 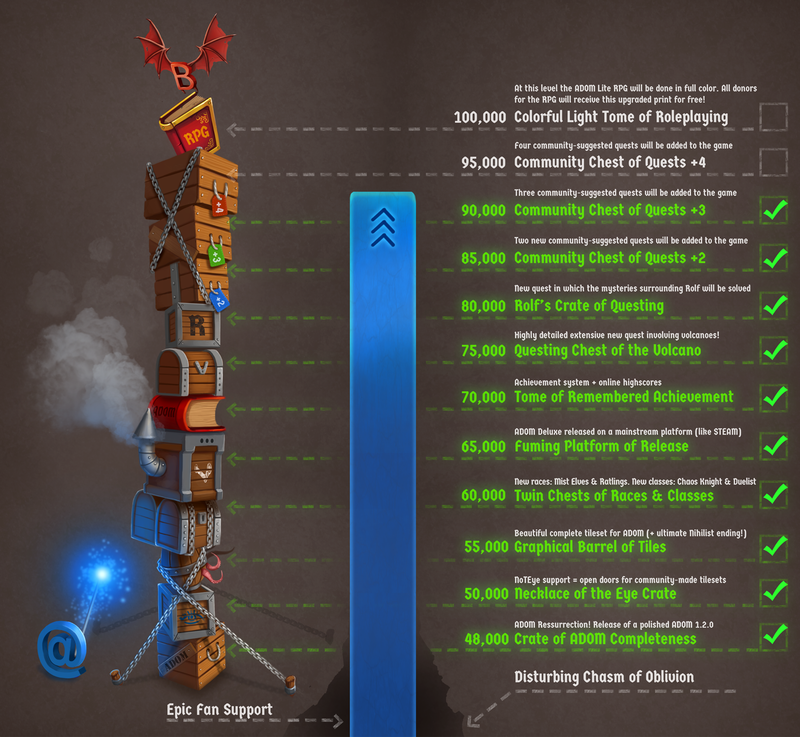 ADOM crowd funding: Let's get over with it! ADOM 1.2.0 Prerelease 1 now available!! !